Undoubtedly, the bed is the central element of the bedroom, around which a harmonious, stylistically chosen atmosphere is formed. Its main function, of course, is to ensure a healthy full sleep. 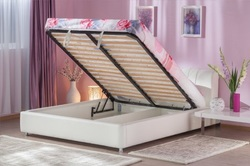 Therefore, a sleeping bed should be comfortable and cozy, have a properly selected mattress and overall dimensions, which should provide a full bed. In particular, in their width they are single, one and a half, double. We are sure that you can easily find the best option for yourself. Those who choose a bed in the bedroom, of course, based on their preferences, as well as the chosen style of bedroom design. A harmonious combination with the surroundings will allow you to create a peaceful corner where you can really have a good rest and gain strength. The sleeping bed itself can be not only a classic rectangular shape, but also round, oval, arc-shaped, and so on. There are many designer models on the furniture market that are notable for their exclusivity and magnificence. Therefore, we recommend not to dwell on the standard rectangular shape, but to consider the placement in your bedroom of a model that differs in originality. Each type of bed has its own characteristics. For lovers of the classics, these are traditional materials such as wood and metal, more economical options are products made of fiberboard. Models with a soft headboard will allow to settle down conveniently for reading books, work on the laptop. Beds with a lifting mechanism will provide storage space for bedding. 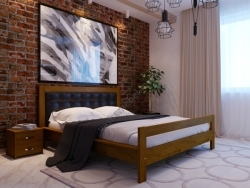 We are sure that to buy a bed in a bedroom in Ukraine with the help of our online store will be a real pleasure and will end with an excellent purchase. For residents of the city of Kharkov, the region and other settlements of the country, we offer very favorable conditions. 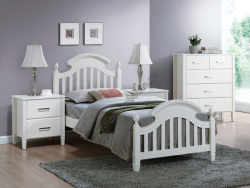 Comfortable, beautiful beds in our catalog have quite loyal cost and most often free delivery. We also offer an assembly service at the customer on site. Therefore, Kharkov buyers have a real benefit to buy from an online store, whose warehouse is located in the nearest location to the buyer’s dwelling. Thus, everyone who wants to buy a bed cheap in Kharkov, contact the online store "Your Furniture". We sell products of domestic and foreign manufacturers, closely monitor the market trends, regularly hold promotions. We invite you to join our Facebook community and get more benefits from your purchase. You will be the first to learn about ongoing promotions, participate in contests and receive substantial discounts. Have a nice shopping.